The home’s exterior and its landscape is one of the first impressions of your house that you present to the public. It represents the pride of ownership, day or night. Adequate outdoor lights add safety and security to your home and make guests feel more at ease. 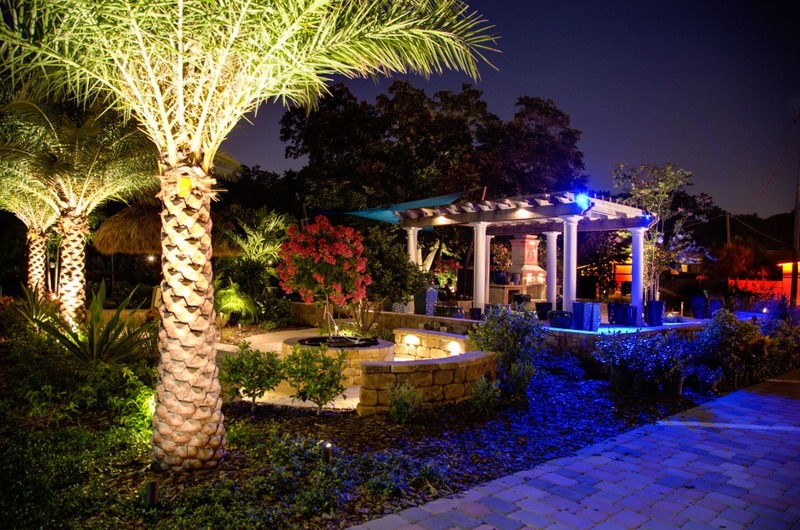 Hire a professional electrician to help you achieve an optimum effect of landscape lighting. Consider the following lighting techniques in your landscape. Safety: Keep a well-lit walkway. Use path lighting to illuminate the area where people walk or drive. This directs visitors to the entrance and make outside of your home look attractive, inviting, and safe. Generally, a light mounted to one side of every exterior door is the minimum lighting for the exterior of a house. Try including a lantern or other wall fixture on both sides of the door and a pendant or a post light near driveways and walkways. Wall lanterns should be mounted lightly above eye level at about 60 to 66 inches from the center of the fixture to the floor to prevent glare. Focal point: Create a lighting plan by choosing one or two points of interest and make this the center piece of your landscape lighting display. Unique landscape features such as sculptures, gazebo, pool, and shaped shrubbery can be highlighted using spotlights. A sequence of spotlights can create interesting silhouettes, shadows, and textures. Build the rest of your landscape lighting plan around your focal point. Use halogen outdoor light bulbs designed to withstand harsh weather conditions; they last longer than other light bulbs and they contain more blue and green tones than standard bulbs so they appear whiter and brighter and also make plants look healthier. Up lighting: This is the perfect way to add depth and drama to trees, landscape features, and architectural elements. Place fixtures in the ground and direct lights upward at an angle to create a dramatic effect that accentuates the detail of a key object such as trees, bushes, statues, and fountains. Down lighting: Shines light down from large tree or eaves of the house to focus on a particular item to achieve a natural look that simulates sunlight or moonlight for a soft and romantic feeling. Accent lighting: Intense light is focused on a specific object to highlight important features and details and to contrast it against a dark background. Use spotlights or mini spread lights. Cross lighting: Lights are mounted on either side of a tree, gate, or arbor to reveal detail and soften shadows by using flood lights or spot lights. Spread lighting: Create circular patterns of light to illuminate flowers or low shrubs from above using spread fixtures. Back lighting: Create beautiful silhouettes or shadows by placing object of interest in front of a lit surface to reveal their shape and form while decreasing texture and eliminate detail. For eye catching effect, angle the light against a wall or fence behind the item. Put light source at ground level; use flood light, spot lights, or in-ground fixtures. Grazing light: Position recessed directional light source 6 to 8 inches away from a wall or tree and aim the light downward to bring out its texture for a dramatic visual effect. Pond lighting: Give your garden pond a glow by using a submersible accent lights. Cross lighting: Lights and accentuates certain objects or areas like statue or gardens from two or more points. Area lighting: Use a flood light or another source of wide light to illuminate large areas for evening entertaining. String lighting: Decorative string light’s function is to add sparkle and festive mood to the outdoor setting, but you can use them to outline pergolas, arbors, posts and piers, and to guide your guests around the outdoor space. Lighting can have dramatic and practical effect in a landscape. 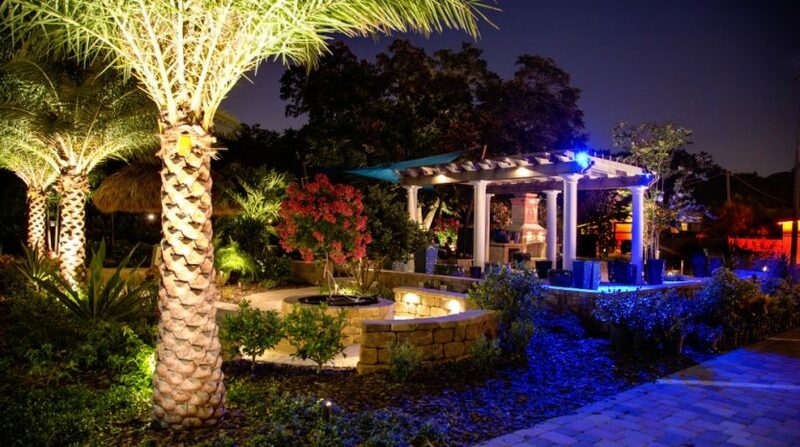 Illuminate your yard with style for entertaining, relaxing, beauty, security, and safety. It can give your home a good aura.